Little Johnny Rivero recently led a band of rumberos in the third live presentation of music from the critically acclaimed LP® CD, Montvale Rumba. This time, the event took place at El Flamingo in New York City. In addition to the usual outstanding dance crowd this club attracts, there was a large showing from the drumming community, which joined in on what I think was one of the most exciting jams I have seen in a long time. The crowd went wild! 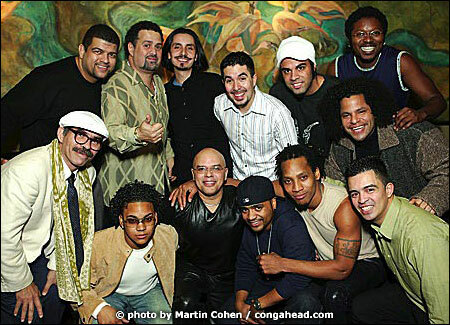 The Montvale Rumba for this particular performance consisted of: Little Johnny Rivero, Pedro "Pedrito" Martinez, Harry Adorno, Maximo Rodriguez, Pablo Vergara, Abraham Rodriguez, and Skip. The percussionists that joined the group for the jam included Davi Vieira, and Gilmar Gomes, from Brazil; Samuel Torres; Orlando Vega; Eric Velez; and Ray Rodriguez. The crowd kept asking for more, and future presentations of Montvale Rumba are being planned.